If you grew up with Enid Blyton and tales of Mallory Towers and tuck shops and midnight feasts, then you might have read this series of childhood books. If not you, then perhaps your parents did (or even their parents). What is not said is that you need to be prepared for when William comes home because then you just don’t know what is going to come through the door… It might be an abandoned dog, it might be a bow and arrow, it might be the local neighborhood kids come to listen to his visiting auntie snore during her nap… You just never know. William is not a bad person – he is just very enthusiastic about life and extremely honest about things. He reminded me of a puppy – how they just focus on something and then gambol towards it not thinking about consequences or anything. Crompton makes him extremely likable and really funny so this little gem-like collection of short stories was a joy to read. 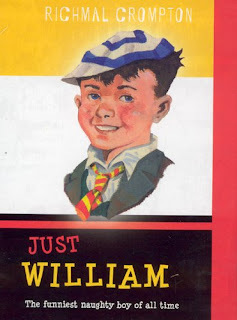 What’s even better than there are loads of Just William books to wade through, some of which are on Project Gutenberg, so if you’re in the mood for a quick light-hearted read about a slightly naughty boy with a bit of Wodehouse-type humor, this series is for you.